Jupiter’s Moon Europa Has Jets Like Enceladus! “Attempt no landings there?” Ok, FINE. We’ll just fly a spacecraft through Europa’s newly-discovered plumes and get a taste of its underground ocean that way! Because it has them, and so we could. This was the big news from NASA, ESA, and Hubble researchers today: Jupiter’s ice-covered moon Europa (yes, the one from 2010) has Enceladus-like plumes of water vapor near its south pole. 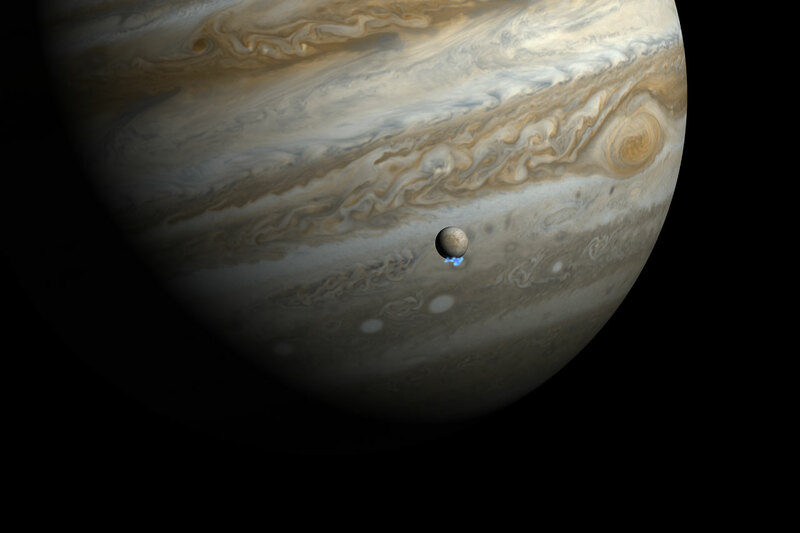 What’s more, these plumes appear to vary depending on the moon’s distance from Jupiter; the giant planet’s gravity is “squeezing” Europa, causing the plumes to shut off when it’s closer and turn on when farther away. Now I’m no scientist, but I’d call that pretty solid evidence for a subsurface ocean… and darn good reason to scramble some exploration missions out to Europa tout de suite! Read more in my article on Universe Today here. Next Post There’s a Jade Rabbit on the Moon! Still an exciting new that this discovery. Also yeah “tout de suite ” a new probe for go to see “de visu” these water vapor plumes ! !